Solo Travellers Group had given me an opportunity to talk about my solo travels in the India meetup in Ahmedabad. Going beyond that, they had a quick interview with me and it has been published on the Solo Traveller Site. I am also taking the liberty to share the same here on my personal site. I am an energetic soul which is passionate about Business, Technology, Bollywood, Travel, Language and Social Enterprise. I work with a silicon valley company Infostretch where I help organizations from the Fortune 500 to startups to achieve their digital vision and accelerate innovation. During the course of last nine years, I have held multiple roles and driven several initiatives. I am also associated with social enterprises and industry-academic initiatives. I am a Bombay boy who has lived in Pune, Ahmedabad and London. I graduated from Narsee Monjee College and completed my MBA from S P Jain Institute of Management & Research. I hold a PhD degree from the University of Mumbai. 2. How many countries and Indian states have you travelled? I have visited about 50 countries in 4 continents. I have visited more than half of Indian states (15) with a heavy travel history in 4-5 states. The Bergensbanen is one the most famous and beautiful train journeys in the world. I wanted to know whether it was really beautiful or another marketing hype? I got the opportunity to check it out this winter. And I can conclude that it was indeed a very scenic and mesmerizing train journey. 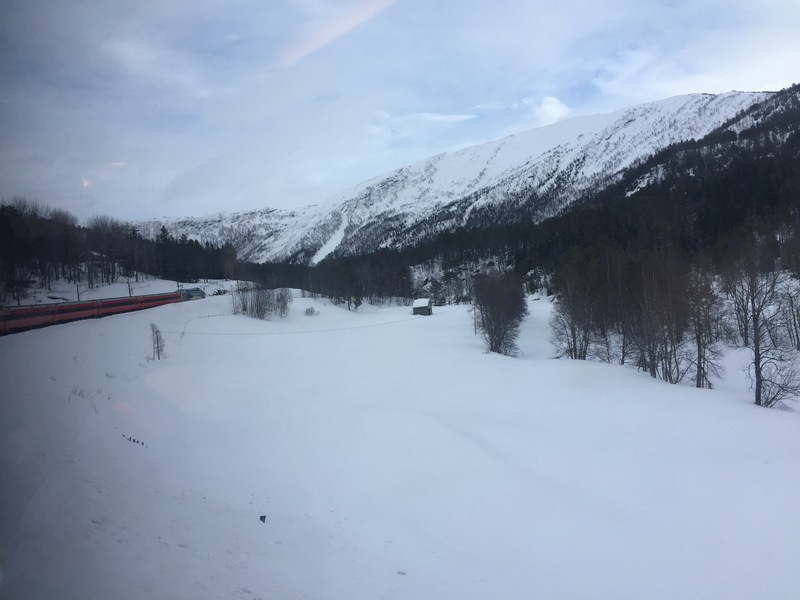 The Bergen – Oslo Train ride offers breath-taking views of magnificent mountains, nice forests, lovely lakes, Fjords, cute countryside, villages, mountain houses and cabins. The railway is an engineering marvel with hundreds of tunnels, sheds and railway stations in one of the most difficult terrains. I had taken a similar beautiful train ride in Switzerland and had explored a similar landscape of mountains, rivers, forest, cabins etc. The Swiss experience was green experience and it had its beauty – it’s still green in my memory. But this Bergensbanen experience was snow white and it gave me a new happiness. I am glad I did this train ride in the winter season. The luck was also on our side. It was perfect sunny day. The powder white snow laden landscape was shining bright. The pure whiteness offered a beauty of its own. It was sheer bliss. It was La La Land. It was nature at its best. Nature is beautiful. Nature is magnificent. Nature is charming. Nature is refreshing. Nature is energizing. The tunnels played hide and seek. Each tunnel would reward with an exciting view as the train emerged out. The entire 7 hour train ride was a pleasure of its own kind. It was a soothing, peaceful and a very memorable ride. One of the recent memorable experience was Petra @ Night. Petra is the most amazing World Heritage site and truly a wonder of the world. During the night, the whole path of Petra’s few kilometre Canyon walk to Treasury was lit with oil lamps. The thousand candles lit Treasury was a sight to watch. We sat and enjoyed the beautiful Treasury while listening to the traditional local music and sipping the Bedouin tea. And the moon-star lit sky made the Petra night even more magical. Indian temple towns give me lot of peace and Shankheshwar is one of my favorite places. 5. Tell us about your fears and anxieties when traversing solo. How you keep them at bay? When I started solo traveling, there were lot of fears and anxieties – mostly useless. But with each solo trip, these subsided. The fear or anxieties were common – how will I manage alone? Will I get bored? Can I trust people? What if I get robbed? What if I get mobbed? What if I am left at an unknown place? What if I die and no one knows where I am? Will I get bored? Will I get the right food? The best remedy for these fears is action. Just travel and take the fear out. And that is what I did. With each trip, my fears and anxieties subsided. While traveling to a distant land, keep the fears at bay by planning well and starting safe. Start with reputed hotels and central areas in unknown cities. Keep family and friends informed about the whereabouts. Initially, travel in free walking tours to get a feel of the city and people. Once you gain confidence, you can start being adventurous. The world is a beautiful place. It is much nicer and safer than we think. 6. What’s your favourite travel quote? 7. Any travel tips for the readers? – Take a solo trip, if you have not already done one! If you have certain destinations on mind, great. Else, open up the map of the world and decide based on your interest, budget etc. One can also visit different travel blogs and websites and make a choice. – Start small: Start traveling solo within known places and cities. Explore a town or a city near you. Explore a state where you have friends and relatives – so there is backup. Or when you are traveling in a group, keep aside 1-2 for solo travel. Then slowly you can move to larger and bigger solo trips. – Plan the travel well in advance. Gather as much information as possible about the destination. Apart from usual sites, read personal blogs and travelogues of people – often they contain gem of ideas and advice. – Be Adventurous – Try new places, new countries and new experiences. Do not stick to the usual tourist spots. – Let your friends and families know about your whereabouts. Use technology to update friends and families. Use social media for leaving a digital trail. – Food – Experience local food as it is an important part of the culture. What is the fun of traveling to Italy and not having local pasta, pizza or gelato? What is the fun of traveling to Poland and not visiting the milk bars? Also, when one is traveling alone, it does not make sense to carry lot of good items. Keep some energy bars and dry fruits and chocolates for backup situation. – Less Is More – Pack only the bare necessities. – Accomodation – Try local hostels or traditional hotels. Holiday Inn and Aloft would be same across the world. One can even try local homestay. – Be A Responsible Traveler – Do not harm the beauty of the local place. Do not waste local resources and water. Avoid creating a lot of waste and keep the places clean. Be an environmentally friendly traveller. – Never make a trip without a smile and a toothbrush. 8. Where are you off to next? The next solo trips are planned in Central Asia and Vietnam.